A "superpod" of dolphins was spotted swimming in California's Monterey Bay this week. For a short week, it sure has been a long one. So here's something refreshing. 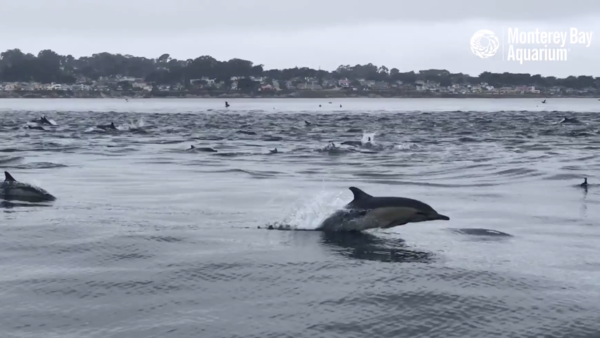 Over the last week, a group of common dolphins has been racing along the Pacific coast in Monterey, Calif. So Patrick Webster, the social media content creator at the Monterey Bay Aquarium, set out on Monday to shoot video of the mammals, working together to corral schools of small fish. What he captured is a remarkable scene: dozens and dozens dolphins, breaking through the surface and plunging down again, under skies the same gray as the water. Webster said the whole group was thought to number more than 1,000. "The event isn't uncommon per se—it's a yearly occurrence, we have seen these superpods from the back deck at the Monterey Bay Aquarium this time of year before," Webster said in an email to NPR. "However, it is fairly rare to see them this close to shore and so readily observable by people, these gatherings are often found way offshore." The aquarium says this gathering is what's known as a "superpod" – when a bunch of dolphin pods come together to make a huge pod for chasing food. We know what we'll be doing this weekend: turning up the sound and watching this video on repeat.